Boo, a 13-year-old dog, found himself in a very precarious place. Boo had walked out onto an icy pond and fell through! 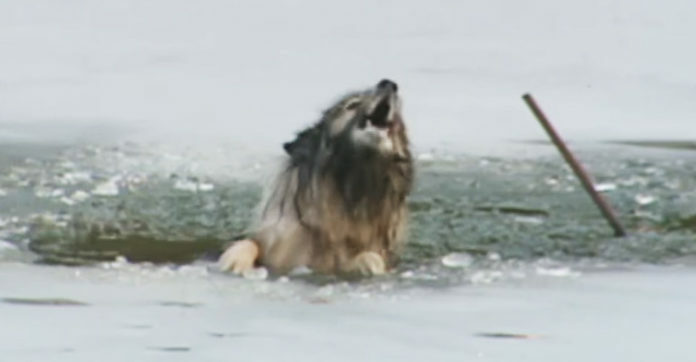 He struggled in the freezing water and managed to yelp out for help. The brave men and women from a fire department in Delaware were able to pull him to safety. Boo was taken to the vet and was given a clean bill of health. His family will now be sure to keep an extra eye out for Boo when they go walking near the pond again. We all know that you can’t teach an old dog new tricks – but I have a suspicion that Boo is going to remember what happened that day and won’t wander out onto the pond anytime soon! You can watch Boo’s dramatic rescue in the video below! You can’t help but cheer when they reached into the cold water and pull Boo out!